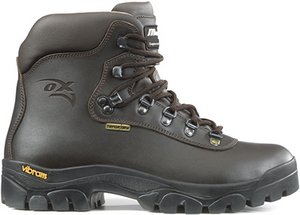 Reflecting Italian design and rugged construction, the rock-solid Mondeox Rock OX 26 heavyweight trekking boots is ideal for backpacking and rugged outdoor travel. The upper is made from high quality leather with a natural hydrophobic face, and water resistance is ensured by the waterproof & breathable Tepordry membrane. The new OX Comfort insole guarantees a high level of breathability and excellent shock-absorbing effect especially in the heel zone for total comfort at every use. Proven Vibram® New Bifida outsole delivers shoes for maximum stability when moving in the field and its rugged construction ensures long life of usage.